Go to the Appearance section and select Menus. Look on the left hand side for a section labeled Links and click on it. This area can be used to create custom links. The tel:+ lets your phone know that this is a phone number. The portion after the + is the number to be dialed. In this case our number is 1 (800) 842-5558. It’s important that you do not include any punctuation or space here, just the actual numbers. You’ll also need to include any area code or country code as needed.The second spot there is where you place your label. This is the text that your visitors will see on your site. You’re welcome to add punctuation and spaces here too if you’d like to. Once you have your number and the labeled set, you’ll need to add your custom link to your navigation menu by clicking the “Add to Menu” button. Now your phone number will work like any page, category or other menu item on your site. You can drag and drop it to rearrange the order. I would suggest keeping your phone number last in your list and not as a sub-menu item so it’s easily seen and accessible. Once it’s in place, save your changes. That’s how to add a phone number to your WordPress navigation menu. If you have any other creative uses for your navigation menu, be sure to share them with us in the comments. Works amazing! I’ve been looking a slick way to do this and bingo! Two thumbs up Bill! great you make my day thanks a lot for sharing such amazing information. Awesome… so simple and powerful. Cheers! It is indeed a very good trick to have a clickable phone no. on the menu. In my case, the phone no. gets hidden under the menu on phone. Below is the theme that I am working on currently. You cannot even add a text widget on the header. Is there way that I can display clickable phone no. underneath logo? Most likely you could edit the header.php file and locate the spot for the logo and then add in the number below it. 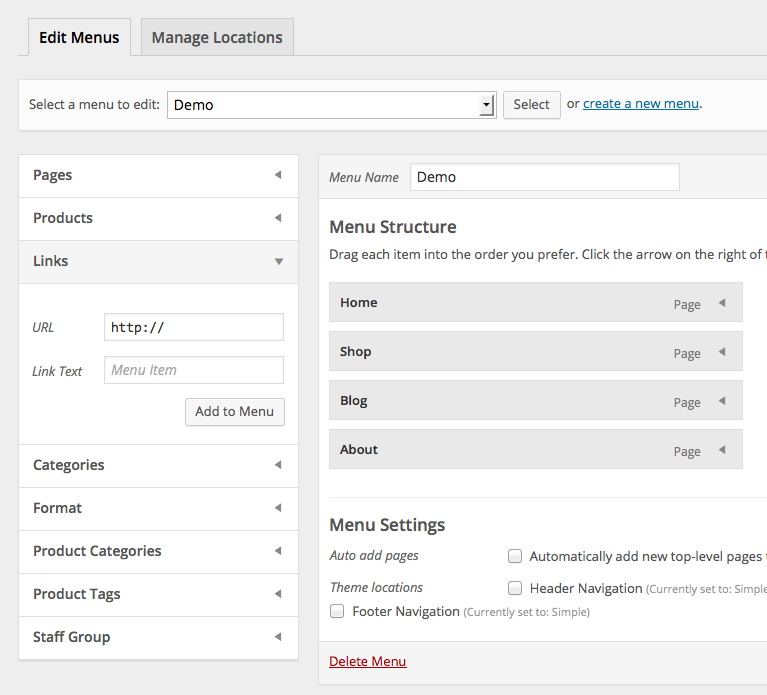 WordPress’ built in editor is in the Appearance section of your dashboard. You might also ask the developer of the theme to help you out with that since they will know its ins and outs best. Thanks for that. I look for this all day. Tried various header mods that didn’t work and plug-ins that did nothing. Thanks very much! How to give the link, if the number is inside the contact menu.. Like you are saying it is displayed in menu categories only. I’m asking about the number which is inside the page. For inside the content of a page, it’s the same idea. Create a link and instead of it going to a URL like http://yoursite.com, use tel:+18008425558 where your phone number is 1 (800) 842-5558. Hi Bill. Thanks for making this article. I too was having an issue with a popular theme tacking on the http:// breaking the tel link. But as the other commenter “Brad” pointed out you can also use the callto://1######### link. This worked and the theme did not tack on the http to the callto link. If you click ‘Save Menu’ in the bottom right, it updates the page and shows it. I’m using Canvas WooTheme (recent download) and am having problems with it sticking as well. (see http://www.bizresearch.com masthead/header) – wondering if it’s because our masthead header menu bar is black, but if I try to select text to see if something shows up, nothing happens. I have a picture I can send if needed. Hi Laura, looking at the code it doesn’t appear that the link has been added to the navigation menu. That’s why it isn’t even there as black text on a black background to select. You might double check to see if it was successfully added to the navigation menu. There has been a long standing bug in WordPress that can cause menus with more than 16 items to become impossible to save changes. It occurs most often on shared servers and can be hugely frustrating. There’s an article at WP Beginner (http://www.wpbeginner.com/wp-tutorials/how-to-fix-the-custom-menu-items-limit-in-wordpress/) that can show you how to make an adjustment to the server that can help out. Thank you for sharing this information. Greatly appreciated. thank you for this article. Could not figure out how to make an older theme have a clickable button but this did the trick. Hmm…It worked and it didn’t… The ph# displays as a clickable link – however the Skype Icon is missing and once the link is clicked it says “requested content cannot be loaded”…any idea what I might have done wrong? Otherwise this is an awesome little gadget, thanks! The “requested content cannot be loaded” message is likely from the computer not knowing what to do with a phone number as a link. Most folks don’t have their desktops or laptops set up to place and receive telephone calls so this is likely something that will only benefit users on mobile phones. with the URL being just a # so that it doesn’t go anywhere. That way people can easily find the fax number even if they can’t click it like they do a standard phone number. How do you use this trick and not get an error: “The address wasn’t understood” on desktop? Great question. I don’t believe there is anything that can be done on the website’s end to change that. If the visitor’s computer is set up with some type of telephone capability or is at least aware that such capabilities exist, then it may dial the number for you. Otherwise the user may get an error of some type. That said, I’m not sure what else they would expect clicking a phone number from their computer. So for the phone number Call menu button to work, I would have to set up another theme for the blog/site? There is nothing in the WordPress core to keep you from adding a link like that so if it’s not working it’ll be the theme or a plugin that’s causing it. You might could use one of the “mega menu” plugins out there that replace a theme’s menu system with one of their own. That might be a way around it without switching themes. I have entered callto://12032404020 as per suggestion under comments. I have also tried tel:+12032404020 but they don’t stick. It’s possible that the theme is set to filter out anything other than a traditional URL. Sorry about that. Any thing else sticks, but the phone number. Thank you so much for getting back to me! Any idea? Would you mind posting exactly what you’re entering as the URL here? I loved to see how easily you can add the phone number to the Menu bar. Only, for me the URL stays blank no matter what I do. Any suggestions what I can do? HELP! What happens if you enter a typical web address in the URL field like http://google.com? great(and brilliant) tip. I have never thought about this. will be hidden as one of the dropdown menu.ie due to responsiveness. is there any way to always show on top . any suitable plugin is ok . But I want in the navigation like you gave. It may be possible to do that. It just depends on how the menu is constructed. Some mobile menus would be simple to do that with. Others replace a traditional menu, which is typically made up of li tags, with a select form. A menu like that would not play nicely with keeping the phone number visible without clicking on the menu link. If you leave a link to your site, I could take a look for you. Thanks for the reply. The phone number is interfering on small screens. Hi there, do you have any tips on keeping a theme responsive after inputting this kind of link? It really depends on the theme being used. Most will treat this just like any other link in a navigation menu. Is the phone number obscured or interfered with on small screens? hi, this is very helpful, however i am not only trying to make one number clickable. it is plenty, i have a store locator tab and for each store there is a number, so i am trying to make these clickable, can you help? You can add as many numbers as your theme has room for. There’s not a set limit in WordPress for how many links like this you can add. Just repeat the process for the additional numbers and that’ll do it. The simplest option would be to add the link to a widget area. You could add it in a text widget or with a navigation menu widget. Since most themes are made to show sidebar areas throughout, that would give you lots of visibility for the link and wouldn’t require any editing. If you want it outside of a widget area, you can do that too, but it would likely require editing the theme. Exactly how to do that would depend on the theme. Every time I try to delete the http:// it reappears when I add it to the Menu and then the site wants to link it to a website rather than a phone #. Any suggestions for this problem? If the http:// is appearing in your navigation bar after you’ve removed it from your custom link, there must be some function that’s either in the theme or plugin that’s adding it back in. It shouldn’t be there if you’ve deleted it. That way you can create links to internal anchors on the same page if you wanted to. You can also use the callto://1######### My understanding is that this allows desktop users to use things like Skype to call as well as work for smart phones. Good to know Brad. Thanks. Yes, tell:// will trigger an error for desktop/laptop users, while callto:// will work just fine on phones (probably offering for the user to choose and make a phone or Skype call), while it will trigger Skype for desktop/laptop users. Thank you for making this post! I need to change the text color of the phone number so that it will stand out from the rest of the nav bar options. I tried the following css with no luck. I’d be glad to take a look for you. What’s the URL to your site? Great question. You can typically do that, but the how will depend a bit on the theme being used. Any chance you could post a URL to your site so I can take a look for you? That was so easy and another improvement. that worked like a charm! thank you so much! it’s the little victories i love the most, especially when it’s due to WP admin functionality allowing me to change a site dynamically within the graphical interface. it’s one of the many reasons to go with a CMS in the first place. You’re absolutely right. Anytime you can leverage the CMS for a win like that is fantastic.